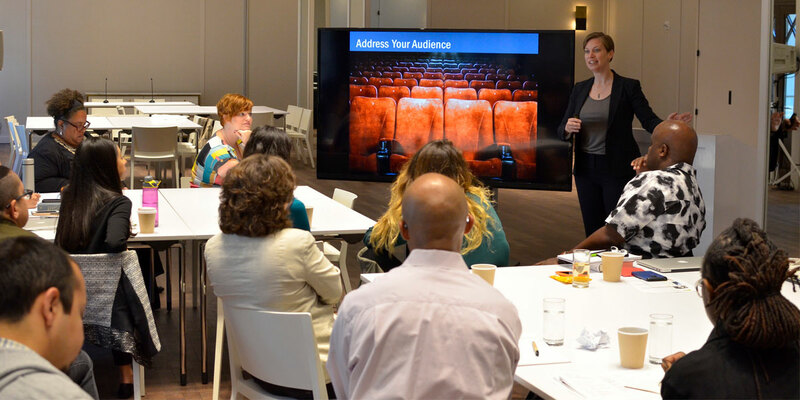 The Opportunity Agenda’s Communications Institute is an annual event that brings together diverse social justice leaders from around the nation for intensive communications skill-building and support. The Institute, which takes place in New York City, is a four-day residency that prepares the movement’s up-and-coming voices to cut through the noise with effective messages that will persuade and mobilize key audiences. Communications Institute Fellows receive comprehensive training on a variety of communications skills, including framing and narrative development, utilizing public opinion and media research, radio and on-camera interviewing, persuasive writing and understanding digital communications such as social networking, and appearing on-camera. In addition to key staff of The Opportunity Agenda, the faculty includes other outstanding communications practitioners. Institute Fellows are invited after a selective vetting process and are expected to demonstrate an interest not simply in learning new communications skills, but in utilizing them in specific social justice work on a relatively short timeline. Framing and Narrative – Research and practical experience show that echoing certain values, themes, and arguments can move key audiences. We work with Fellows to identify those themes and values, and work together to craft stories, metaphors, and messages to help to harmonize our communications so that our shared story can rise above the din of a rancorous media and political environment. Public Opinion Research – Understanding and using public opinion research is crucial for those who hope to reframe the debate and influence policy. We review recent research findings on specific topics and suggest messaging within the shared narrative to address the challenges and opportunities these attitudes present to moving policy. We also discuss how advocates can strategically use public opinion research and media content analysis to meet their goals. Talk Radio Interview – Advocates, experts, and grassroots organizers are often the most compelling spokespeople, but may lack the tools they need to deliver their message. We discuss basic tips for how to effectively communicate the organization’s message and further its priorities while dealing with the flow of the interview; we then give each Fellow a chance to role play a mock radio interview and experience the challenges of communicating to a radio audience. TV Interview – Fellows receive tips for effective communication in the limited timeframe that is usually available during on-camera interviews. Each Fellow will be able to role-play a brief videotaped interview, followed by a feedback session with the entire group.